For those of you who don't know Branson, Missouri, it is a truly remarkable vacation destination offering rugged beauty, pristine lakes, abundant fishing, and world-class entertainment for the whole family. Branson has more theaters with live entertainment than anywhere in the United States and has deemed itself the Live Music Capital of the World. It also lays claim to being the number one motor coach destination in the country, and the Veteran's Capital of America. And for all you golf lovers, there are beautiful and challenging golf courses carved right out of the mountains of the Ozarks. There are activities and attractions for all ages such as water skiing, scuba diving, snorkeling, boat and small craft rentals, fishing guides, parasail rides, sky coasters, hot-air balloon rides, as well as several museums. There is also shop-till-you-drop fun with outlet stores, malls, a huge old fashioned dime store in historic downtown Branson, craft malls, antiques, boutiques and specialty shops. If you can find time between all the fun you'll be having at the reunion, there is no end to the entertainment Branson offers. In fact, if you plan to stay longer, here are some live shows you won't want to miss: Showboat Branson Belle, Branson's American Star, Silver Dollar City Theme Park, Shepherd of the Hills Outdoor Theater and Homestead, and The Dixie Stampede. 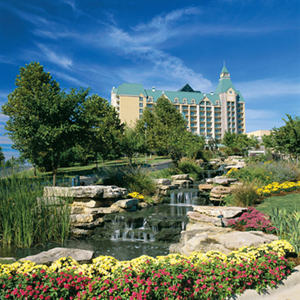 To be at the heart of all the action, guests will be staying at the enchanting Chateau on the Lake Resort and Spa perched on a beautiful, forested Ozark mountaintop overlooking the pristine waters of scenic Table Rock Lake. This luxury hotel with old world charm and refined amenities was designed to enchant visitors and has been called the "Castle on the Lake". During your stay at Chateau on the Lake, you might consider reserving time to relax and unwind while being pampered at their full service spa.